Shopping online can be quite a time-saver. You don’t have to get the kids or yourself ready—just plop in front of your computer in your pajamas with a cup of coffee and this season’s shopping list. An author, researcher, and humanitarian, not only have I come across the benefits of friendship in my work, but I’ve experienced them personally. It’s important to be aware of other research which suggests that one should be careful to select positive friends, as the stress that comes from bad friends can negate the health benefits of having their friendship. Danny the Dragon Meets Jimmy – LIVE on ABC News 10! 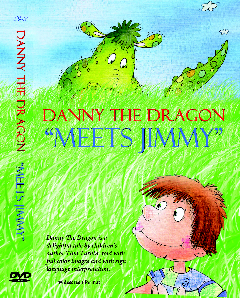 My new Danny the Dragon Meets Jimmy DVD (including sign interpretation for the deaf) is quickly becoming quite popular with parents, teachers, librarians and children alike. This is a very unique video. Sacramento’s “Moms Like Me” and Sacramento’s ABC News 10 talkshow entitled “Sacramento and Company” will feature a television segment about my DVD between the hours of 9 and 10 a.m. Pacific Standard Time, Friday August 16th (for those who are in the Sacramento area, please tune in to your local ABC station to watch the show live). They will air a few DVD clips and are hosting a terrific give-away to 5 lucky winners, to each receive my DVD! Start looking at the glass half-full! Keeping oneself in a good mood is likely to stretch your life span. Studies show that people with a positive way of looking at things—even just regarding the aging process—can increase their life span by seven years. Stress and negativity can lead to overall bad health, affecting the heart, immune system, and endocrine system. Choose whatever healthy mood-boosters you know work for you—such as reading a good book, baking cookies, or taking a relaxing bath. Having friends certainly makes you feel good. Now studies are showing that they may in fact be good for you! According to a recent Australian study, there’s evidence that friends may actually help your life last longer.